Ruminations: "Let me be brave..."
I had a conversation today in which I made a striking connection, so I'm going to share it. My mother had three different cancers over a period of 30 years. She was finally done in by leukemia. When faced with imminent death, one can either feel helpless or resigned. Fear and rage have no use. So my mother took experimental chemotherapy not because she had any expectation of it working, but in the event that the doctors might learn something from her that would cure the next patient. 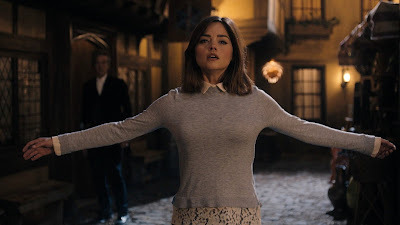 When I saw the recent Doctor Who episode, "Face the Raven", I saw my mother standing there looking for all the world like Clara Oswald.